Tyton BFA is a 2013 Bay stallion that stands 15.1 hands tall. Tyton is a product of small breeders chasing a dream of raising a beautiful colt that brings what the Arabian Horse Community wants & needs in a breeding stallion. Tyton is sired by world renowned Everafter NA & out of Bradley’s Flinthills Arabians own Merri Madeline. The combination of these two horses bring some of the most desired pedigrees in the Arabian Horse Industry, Everafter NA, Sir Fames, Odyssey SC, Versace, Fame VF, Desperado V, just to name a few. When taking in Tyton BFA you see some of the amazing qualities you would expect to see with such an amazing pedigree. He stands tall & proud with a beautiful shaped neck & a head that is everything an Arabian breeder dreams of, huge black eye balls & sockets, short chiseled face with large expressive nostrils, & topped off with perfect tippy ears. When in motion this bay stallion will take your breath away, his lofty & fluid motion is very impressive. Then followed with his beautiful tail carriage & Arabian type he truly draws you to him. 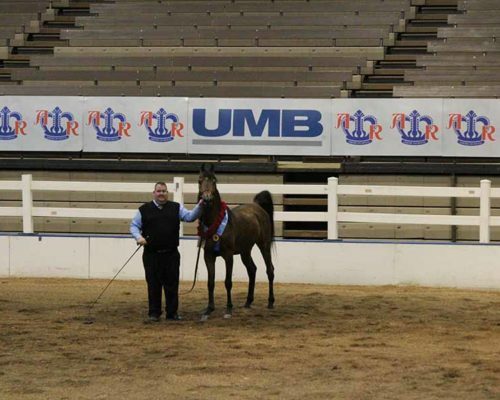 Confirmationally he is a very well balanced horse that has great legs & feet that sometimes alludes breeders. 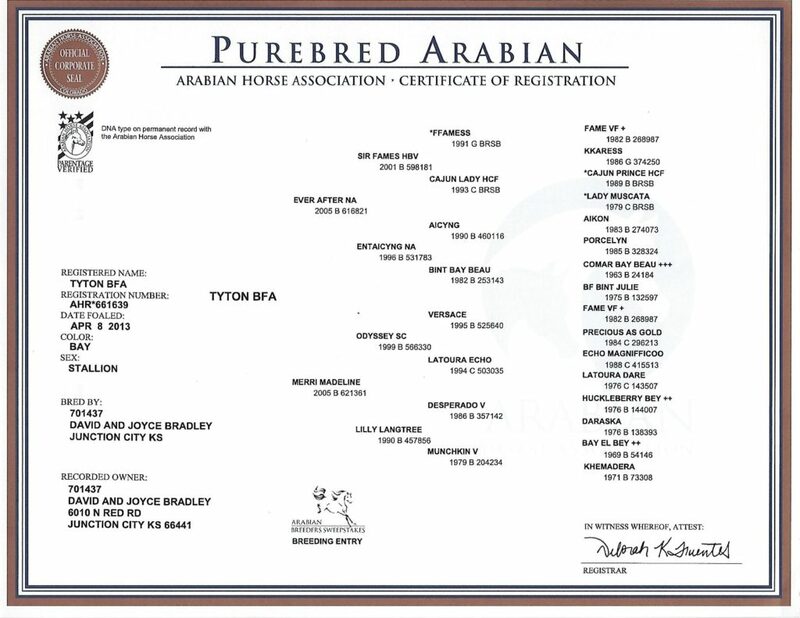 In conclusion, Tyton BFA is a great representation of what an Arabian Stallion should look like & is living up to his pedigree in physical looks & presence, the next faze of his life will be seeing him pass along these highly desirable features to his future foals.